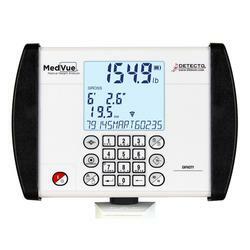 Ideal for home healthcare, uses for these lightweight portable scales are almost limitless. 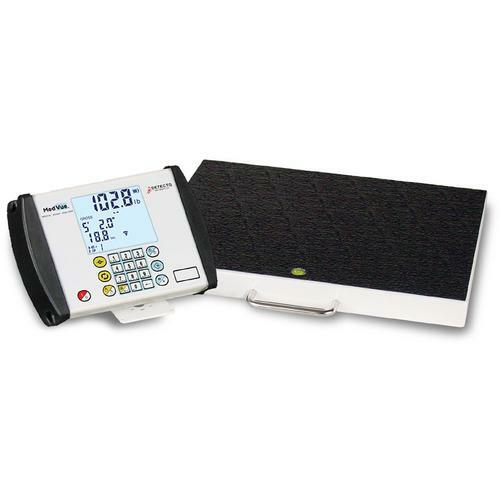 Featuring battery power and built-in carrying handles in a compact design, these scales go anywhere. A large, easy-to-clean platform measuring 18 D x 14 W x 2 H inch (46 D x 36 W x 6 H cm) features a black non-skid mat and bubble level for safety assurance. Lock/Release key can hold weights and BMI calculation. Powered by 6 C batteries (not included) or optional AC adapter. USB, serial and optional Ethernet ports. EMR/EHR ready. NTEP legal-for-trade. OIML EC Class III model available. Optional stainless steel wall-mount grab bars also available for patient stability (GBSS18-WM, 1 per). BENEFITS OF WI-FI CONNECTIVITY - DETECTOs MedVue offers optional Wi-Fi connectivity with up to 20 ft. range (varies depending upon environmental conditions). Wi-Fi offers a number of benefits over Bluetooth, including greater range and security. 350-Degree Swivel Mounting Bracket - Enjoy freedom of movement wherever you need to position the display with the MedVues 350-degree tilt-and-swivel mounting bracket.